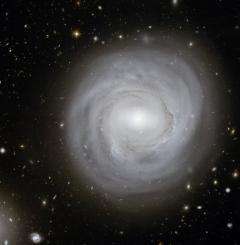 A file photo of a spiral galaxy. Short tourist flights into space are expected to begin launching from northern Sweden in 2012, one of the companies involved in the project said Wednesday. Short tourist flights into space are expected to begin launching from northern Sweden in 2012, one of the companies involved in the project said Wednesday. "We expect that the first tourist flights leaving from the United States will start around 2011 and that Kiruna (in northern Sweden) will be next about a year later, in 2012," Spacesport Sweden spokeswoman Johanna Bergstroem-Roos told AFP. The flights will be run by Virgin Galactic, owned by British tycoon Sir Richard Branson, which will first send paying customers around 110 kilometres (70 miles) above the earth from New Mexico in the United States. Virgin Galactic said Tuesday it had signed up five Nordic travel agencies that will be authorised to sell tickets for both the US and the Swedish launches, which will to begin with cost 200,000 dollars (153,000 euros) a piece, although the price will likely come down over time. "We hope Kiruna will become Europe's main launch pad for the tourist flights," Bergstroem-Roos said, pointing out that the town located some 145 kilometres (90 miles) north of the Arctic Circle has been home to the Esrange Space Centre since 1966. "The suborbital flights that will be sent up with tourists are the kinds of flights we already run from Kiruna, although we today send crewless flights much higher up, to 800 kilometres," she said. "We are truly experienced when it comes to space missions." Kiruna is also already a magnate for adventure and wildlife tourists eager to see natural phenomena like the Northern Lights and the Midnight Sun, stay at the nearby Ice Hotel or set off on ski, dog sleigh or snow scooter trips. "We expect that if one person in a family that comes up here wants to fly into space, maybe the other family members will sign up for other experiences," Bergstroem-Roos said. Nearly 300 tickets have already been sold for the short tourist space flights, she said, adding that while Danes, Finns and Swedes were among the purchasers, most of the existing ticket-holders would not want to wait for the Kiruna launches to begin and would choose to fly from the United States. "Most people want to be first," she said. So the first civilians in space will be the ultra-rich. How wonderful for them. Remember what happened when the ultra-rich decided they wanted to scale Mt. Everest and people came forward to "guide" them? Bad decisions fueled by money. It should be interesting to see what kind of blunders the unlimited funding and greed will produce.